My 1973 BMW R60/5 is parked right now at a Panera Restaurant and I am lamenting the fact that it’s raining outside, and I forgot to bring my rain jacket. Forgetfulness is a common characteristic of the senior biker. Mindfulness helps. Before I leave, I say to myself: “Okay, what am I missing?” However, along with my raincoat, I forgot mindfulness too this morning. I was married for 23 years before we divorced. Suddenly, I was thrown out into the dating world (seven years ago now) and it was a shock. I really didn’t know how to do it. The rules I had used years earlier, which weren’t that good even then, were clearly outdated. Still, in the last few I managed to meet and date a few women who I somehow inexplicably charmed even with my anachronistic ways. Maybe it was pity for me. I’m not too proud. I can take pity. Being a teacher, I don’t work in the summer, and given that my children live in distant places I tend to travel, especially on my motorcycle. 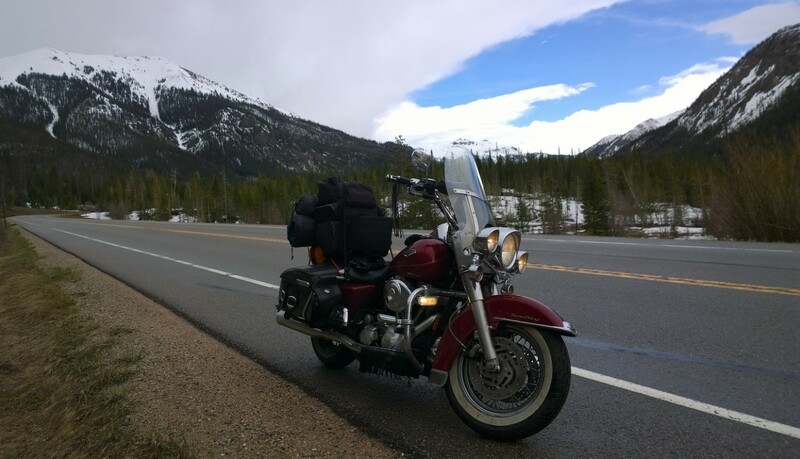 My daughter lives in LA and I live in Georgia, so I like to take cross country trips on my motorcycle to see her. I’m getting excited because she is due to have her first child in a little over a month. I’m planning on riding out there. Since my divorce, two of the women I dated dumped me because of travel and distance. One, for some reason, didn’t like it when I announced that I was heading out on the bike for a couple of months. We discussed it but I still got a text from her breaking it off, at a Love’s Travel Stop somewhere west of Santa Claus, Illinois. Another woman, who contacted me through Facebook, I met four times after I just happened to be driving by Peoria, Illinois. After all, it’s only 650 miles from here. (Okay, I admit it – nobody just happens to be driving by Peoria). Our relationship played out well there but didn’t when we tried to take it on the road. After a few months she cancelled any further performances. So, I’ve been wary since. I’ve met a few lovely women since, and I enjoy their friendship immensely. But I always know that at some point I’m going to hit the road once more and I don’t want to go through all that heartache again, riding and obsessing over whether I have another text waiting for me, maybe this time outside Eureka, Nevada on US Route 50. I’ve been down that road before. Such are some of the laments of the senior, gentleman bachelor, biker. ← Announcing!!! My Latest Novel: Hope: The Adventures of Sid, the Buddhist, Ninja Detective; Motorcycles included. Hmmm. Women. Can’t live with then, can’t live without them.